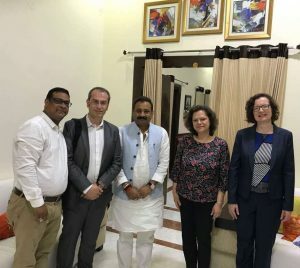 A delegation from the Universities of Cambridge and Reading visited the Minister of Education in Bihar, Dr Ashok Choudhary, in April this year to discuss a new research project on multilingualism in primary schools in India. and a representative from the British Council India, Joydeep Bordoloi [see picture]. This new four year project, entitled Multilingualism and Multiliteracy in Primary schools in India (Multilila), looks at progress in learning and teaching of language, reading and maths in primary schools in India over a period of four years. As part of the project primary school children in Hyderabad, Delhi and Bihar will be invited to take language, reading and maths tests, and to carry out tasks that measure their attention levels. The project aims to make recommendations for the development of Multilingual Education and to identify good pedagogical practice in primary schools in India. It is well known that children who use more than one language in everyday life can have advantages in attention and learning skills. Most Indian children are multilingual in that they use more than one language on a daily basis but not all Indian children experience the advantages in attention and learning skills that have been found in other contexts. A key focus point of the project is how children’s understanding of the curriculum content is supported through the use of different languages in the classroom. While Hindi is the language of education and official matters in Bihar, some schools that the delegation visited in Patna make very good use of the children’s home languages, such as Magahi or Majthili, to explain difficult concepts in the classroom. Teachers who are not from the area are given word lists with translations of key terms in the children’s home languages to help them bridge the gap between school and home languages. In other Indian contexts, for example in areas where children have immigrated from other parts of the country, learning through the mother tongue is more challenging because of the wide range of languages that are spoken by the children. Dr Lina Mukhopadyay from the Department of Training and Development at the English and Foreign Languages University in Hyderabad. From left to right: Joydeep Bordoloi (British Council India), Professor Theo Marinis (University of Reading, Clinical Language Sciences), Dr Dr Ashok Choudhary (Minister of Education in Bihar), Professor Ianthi Tsimpli (University of Cambridge) and Professor Jeanine Treffers-Daller (University of Reading, Institute of Education). Research assistants from these three universities are currently carrying out a pilot study in Delhi before the start of the first round of data collection in July. An important project partner will also be the A. N. Sinha Institute of Social Sciences in Patna, which has a wealth of experience in studying the socio-economic and educational context in Bihar. By Professor Jeanine Treffers-Daller of the University of Reading, Institute of Education. What did the Romans do for education? Find out at a unique time-travelling adventure. No homework, no set times for attendance and a slave to take you to school: could this be one of the wilder ideas in a Year Six suggestion box? No, just an ordinary day in the life of an ancient Roman classroom. 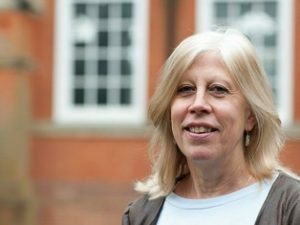 As part of a unique time-travelling adventure organised by leading classicist Professor Eleanor Dickey and the Department of Classics, schoolchildren and families can experience ancient classrooms first-hand at the University of Reading from 27 June to 7 July 2017. Students will have the opportunity to become completely immersed in Roman daily life: dressed in Roman costume, they will learn to write with a stylus on a wax tablet, read from papyrus scrolls, work on Roman school exercises and try their hand at multiplication in Roman numerals. “The changes in the way children are taught now are massive, even going back 10 years. Well we are going back 2,000 years! There was no set curriculum – parents paid for what they wanted their child to learn – no set classes, year groups or times for attendance. Professor Dickey continued: “No obelisk has been left unturned to create an authentic atmosphere, from Roman costumes to windows looking out on the River Nile. “They’ll be no need for pupils to pack their papyrus as we’ll be providing all the equipment including tablets, the Ancient World kind, and reed pens. 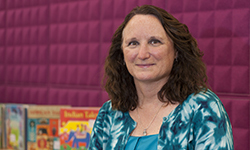 The inspiration for this event arose from Professor Dickey’s work on The Colloquia of the Hermeneumata Pseudodositheana, Europe’s most ancient children’s books. These were manuals written to help ancient Greeks and Romans get around in each other’s languages. They tell of a day in the life of a schoolchild and his teacher as well as containing numerous dialogues that shed light on daily life in the Roman Empire. While much has obviously changed, some scenarios in the book will ring a bell now; from the daily tasks of shopping and banking, to a telling off for a husband returning home late a little the worse for wear. The Roman schoolroom will appear at the University of Reading from 27 June to 7 July 2017. School groups, families, and individuals will all be welcomed. There will be a small charge, which will be waived under certain circumstances. There is capacity for around 20 people per hour in the school room and larger groups will be accommodated by revolving activities. 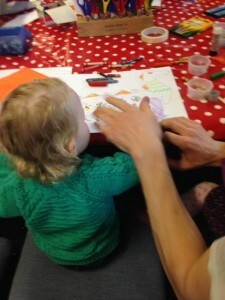 The cost will be £5 per attendee for one school room visit and £10 for the whole day. children and families coming independently. Booking is essential: please contact E.Dickey@reading.ac.uk to reserve a date and time. The Institute of Education (IoE) is ranked in the top three UK Universities in the field of Education, according to the Guardian University League Table 2018, just published. The IoE has leapt up five places to 3rd from 8th last year, confirming the Institute’s national and international standing. Just a couple of weeks ago, the IoE was celebrating its leap by four places to 10th in the Complete University Guide’s Education rankings, which cited the Institute’s “sky-high score for Student Satisfaction”. Find out why we are leaping up league tables by visiting us during our next Open Days on Friday 16 and Saturday 17 June. To book your place, visit our Open Days website. “This significant top three position on the Guardian University League Table for 2018 demonstrates how everyone at the IoE is driven to achieve the very best for our students and for the pupils they go on to teach. Our students go on to success in secure excellent jobs, having studied in a very supportive and exciting environment. “We are very fortunate in our strong partnerships with our much-valued local schools, an alliance that contributes significantly to an engaging and wonderful student experience. The result echoes the IoE’s very strong position in the main UK league tables, being ranked eighth in the country by The Times and the Sunday Times Good University Guide 2017 as well as 10th in the Complete University Guide. “This latest result shows Reading is consolidating its position at the top end of the national league tables. Our academic and professional support staff deserve praise for their hard work, which makes Reading one of the best universities to study in the world. MA open evening 25 May: did you know you can achieve your Masters in Education whilst working full time? Did you know you can achieve your Masters in Education whilst working full time? Our highly regarded MA Education programme is available part-time to meet the needs of busy professionals like you. Taught modules can be taken singly or as part of an award bearing course and you may be able to transfer PGCE credits. Join us on Thursday 25th May 2017 at the Institute of Education for one of our special evenings to learn more. As well as lots of useful information, there will also be time set aside for informal chats over biscuits and a cup of tea or coffee with lecturers, administrators and our Director of MA Programmes, Dr Helen Bilton. We look forward to welcoming you to our evening of discussion and friendly advice, where you can ask all your questions and find out about our programmes from the people who teach them. At the Institute of Education, we believe that the ‘children’s workforce’ should be spearheaded by a cadre of highly creative, analytical and experienced graduate leaders. We invited current potential early years teachers to a free event devoted to discussing the concept, rewards and training around a career working with children. There was a programme of talks, with informal discussions with staff available on a flexible basis. After the main talk at 5pm, there were mini taster sessions in each subject along with complimentary tea, coffee and biscuits served throughout. Thank you to all attendees! We all thoroughly enjoyed the occasion. Primary and Secondary School Workers to Benefit from Free Online Courses! Rowing with Olympians: trainee teacher represents Team GB while studying. BecBerkley on IoE welcomed BA (QTS) Education applicants as they arrived at London Road for the third interview day of the season. Nasmajid on IoE welcomed BA (QTS) Education applicants as they arrived at London Road for the third interview day of the season. UniRdg_IoE on IoE welcomed BA (QTS) Education applicants as they arrived at London Road for the third interview day of the season.